Wahweap Marina is located on the western end of Lake Powell in Arizona,about 6 miles from Page, Arizona and is the largest of the five Lake Powell marinas. Even before Glen Canyon Dam closed its steel gates in January of 1963, and the waters of the Colorado River slowly began rising toward its 500-foot goal, work was under way building a temporary boat launching facility at Wahweap. Art Greene, Colorado River runner and owner of Glen Canyon Tours, Inc., with great foresight, had leased this land from the state government. He first built a floating boat landing and, as the lake rose, gradually moved it until it reached an area where he was constructing a permanent marina. 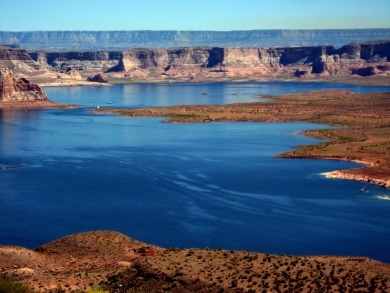 He named it Wahweap Marina after a nearby canyon which is now under the water of Lake Powell. Wahweap is Paiute for bitter or alkali water. In addition to the marina, Greene built a new motel, restaurant and lounge overlooking the lake site. He leased the restaurant and lounge to Whit Parry who also owned Parry Lodge in Kanab, Utah. Wahweap is now operated by ARAMARK, Glen Canyon National Recreation Area's primary concessioner.